We have a large range of nets for all types of ponds. From fish nets to koi pan nets. Algae nets and tiddler nets. Larger mesh nets move faster through the water. This is especially important with bigger nets - which are essential for catching bigger fish with less stress. Some are fixed handle while others are telescopic. Please check the handle length to be sure you buy the right size for your pond. Medium meshed net (3mm) for catching and removing small fish. D-shaped net, 10" x 7" (25cm x 18cm). 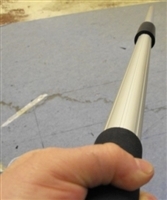 Strong metal handle, 36" (91cm). 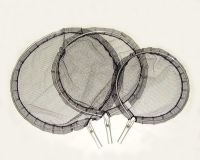 Fine meshed net (3mm) for collecting and removing floating alage & debris in a small pond. D-shaped net, 10" x 7" (25cm x 18cm). Strong metal handle, 36" (91cm). Tight meshed net (0.5mm) for removal of algae and debris. Replacement for the Profi Pond net. Koi sock / transfer tube for safe movement of koi. Perfect for moving larger koi from pond to bowl. Quality Norfine net. Net Extension Handle for our koi pan nets. Premium Norfine Medium meshed net (6mm) for catching koi. Easy to handle - for medium sized ponds. Net head only! Needs the Net Extension Handle. Use to guide fish into bowl or up to pond surface without causing damage or stress. Premium Norfine Medium meshed net (6mm) for catching koi. Easy to handle - for medium - large sized ponds. Premium Norfine Medium meshed net (6mm) for catching koi. Easy to handle - for large sized ponds. Koi sock / transfer tube for safe movement of koi. Perfect for moving larger koi from pond to bowl. Quality waterproof Norfine net. 30cm dia. As used in Japan by the breeders. Premium Norfine Large meshed net (20mm) for catching large koi. Easy to handle with minimum drag due to large mesh - for large sized ponds.